wendy house » Blog Archive » whow will I play with? whow will I play with? 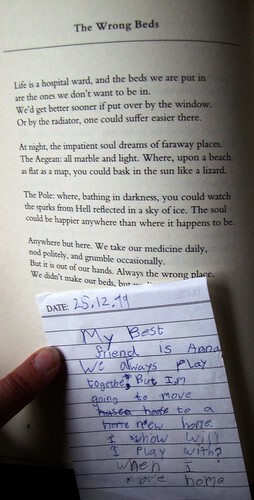 After christmas I found this note from my 6yr old niece tucked in the cover of a book I’d been reading. It now marks a poem drawing parallels between life and staying on a hospital ward where we do not make our beds but we do lie in them by Roger McGough in his book “The way things are”. The note cleverly demonstrates that the word hasea hoase house, unlike home, is terribly tricky to spell. Probably because there are three of those infamously tricky vowels conglomerating in ‘house’. This scribble was published on Friday, November 2nd, 2007. You can follow any banter on this scribble with the RSS 2.0 feed. You can leave a response, or trackback from your own site.